Please prepare and email the following items (no actual passport needed). The Vietnam visa will be delivered to you by FedEx once issued. Passport should have at least 6 months validity left. Otherwise, you must renew your passport first. If you need passport services, please visit our expedited passport services section. No physical passport is needed. Photocopy of passport can be scanned and emailed over to service@visarite.net. Photos should be taken within the last 6 months. Digital passport type photo by email is OK. Image should be in JPG format and at 300 dpi or up. 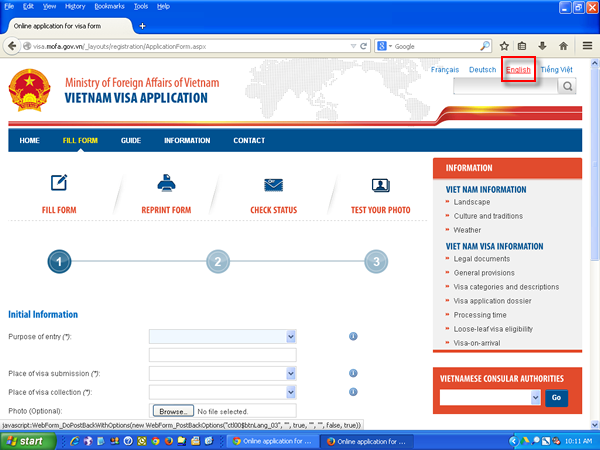 Click here to complete the Vietnam visa application form online. If you have difficulties in completing the application form online, please download and complete the fillable PDF version instead. Your visa will be valid from proposed date of entry as shown on your application form. Visa won't be valid for entry before that date. This is the best way to tell us your application is coming as well as your return address and contact information so that confirmation and status updated can be sent to you via email. Multiple applicants can be entered using one service request form. Please print two copies of the confirmation page. Please include the service request form confirmation page with the application documents. If you scan and email us application for processing, please state digital processing requested, no passport sent in the remarks field of service request form. The invitation letter needs be printed on business letter head with address and contact information. The invitation letter should include the passport name of invited, dates of travel, purpose of travel. The information on the invitation letter should match the information on your application form. The invitation letter can be faxed or scanned. We accept money order, cashiers check, certified check or cash. Please make check or money order payable to VisaRite Service and write your service request confirmation number in the memo. You can write the total amount on one check or money order, no need to send separate checks or money order. Personal check is not acceptable. Passport with visa or loose page visa (in case of digital processing) will be returned via FedEx. Return Shipping Fee listed is for return addresses within the continental U.S. If your return address is in Alaska, Canada, Hawaii, Puerto Rico or the US Virgin Islands, please include an additional $10.00 per order. Please scan and email the items listed above to: service@visarite.net. If you pay by money order or cashier's check, you will need to mail the actual payment to us.